Situated in the southeast part of the country, Mississippi is the 32nd biggest state by area and the 34th biggest in terms of population. It shares borders with Louisiana, Arkansas, Alabama, and Tennessee, as well as having a small stretch of coastline along the Gulf of Mexico. The state of Mississippi is strongly linked with the iconic Mississippi River, which flows all along the western border. The river has played a significant part in the development of Mississippi, with many of the state's big cities being located beside or near the river. Known as the Magnolia State, Mississippi is home to vast swathes of woodland, making it a prime location for plenty of outdoor activities, as well as its small section of Gulf Coast, which is home to popular beach cities like Biloxi. Another key location for the state of Mississippi is the state capital of Jackson, which is also by far the biggest city in the state and home to many key landmarks, museums, and more. There's a lot to do all around Mississippi, with plenty of people visiting the Magnolia State each year for vacations and camping trips. Dozens of excellent RV parks can be found all around Mississippi as well, perfect for recreational vehicle enthusiasts. Read on to learn more about the best RV parks in Mississippi, including contact information for each RV park and details on the amenities and facilities found at each location. One of the most popular and beloved locations in all of Mississippi is undoubtedly Biloxi. And one of the best RV parks in Biloxi is undoubtedly Cajun RV Park. Situated in a key location, mere minutes away from the beach, Cajun RV Park is an amazing location for people who want to explore Biloxi and enjoy all the sights and sounds that have made the city so popular over the years. From this Biloxi RV park, you can visit the beaches, enjoy some water sports, check out the iconic Biloxi Lighthouse, take a boat trip, head off on a fishing charter, visit one of the local casinos, and so much more. It really is one of the best locations for families and couples in Biloxi. Cajun RV Park also aims to offer an authentic 'home away from home' vibe to all visitors and really succeeds in this aspect. The comfort and warm welcome you'll feel at Cajun RV Park are second to none, with the site boasting a long list of impressive and clean facilities for all to enjoy. Some of the amenities you can find at this coastal Mississippi RV park include free cable TV, free Wi-Fi access, free breakfast and coffee in the mornings, a swimming pool, two large pavilion areas for picnics and special occasions, a dog park for your canine companions, a free shuttle to one of the best casinos in the area, an outdoor fireplace for cozy nights by the fire, and a play area for young children. If you like comfort, cleanliness, safety, and a great location to be the key factors of the RV parks you choose to stay at, you'll love Sunroamers RV Resort Park in Picayune, MS. Situated in the southern part of the state, not far from some super beaches and attractions, this RV park is a great choice for people who want to check out some of Mississippi's top spots, but is also ideally placed for trips over the state border and into the vibrant Creole city of New Orleans for live music and fun events like Mardi Gras. Another fun feature of this RV park is that the staff really go all out to make the place as warm and welcoming as possible, with the whole park having undergone recent renovations to be bigger and better than ever. Highly suitable for both short and long term stays in the New Orleans and Mississippi Gulf Coast areas, Sunroamers RV Resort Park is a great option for guests of all ages. It features over 150 individual RV sites with full hook-up utilities and comes with some super amenities too. One of the best features of this Mississippi RV park is its enormous clubhouse; measuring up at over 6,000 square feet, the club house can accommodate several hundred people and comes with its own commercial kitchen, making it a fine choice for special occasions and celebrations of all kinds. Other amenities here include a swimming pool, a chapel, lots of picnic tables and grassy areas, laundry machines, bathhouses, a fishing pond, and a pavilion. The coast of Mississippi is a great place to be, but if you're looking for an RV experience further north, why not consider a stay at Ameristar RV Park? Located right on the banks of the famous Missippi River in the little historic city of Vicksburg, this RV park is a super option for people looking for an authentic Mississippi experience and some great service too. You can head over to Jackson, the MS state capital, relatively quickly from this RV park, and the surrounding city of Vicksburg was a key Civil War location and has some interesting historical sites like the National Military Park and Old Court House to be explored and admired. The Ameristar RV Park in Mississippi offers over 65 drive-thru RV spaces with all the services and amenities you need to have a great time. The nightly rates at this location start at just $30, so it's one of the most affordable RV parks in MS, and each site offers 30-50 AMP service and standard full hook-up utilities. 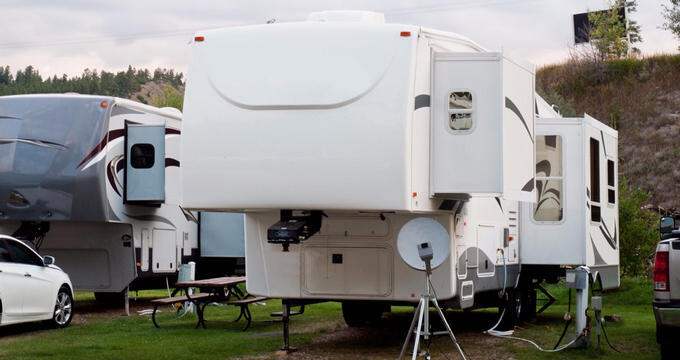 Other amenities and features of this RV park include free shuttles to a local casino, laundry machines, free coffee making facilities in the lobby, a swimming pool, hot showers, clean toilets, a pet walking area for your furry friends, speedy Wi-Fi access, and more.